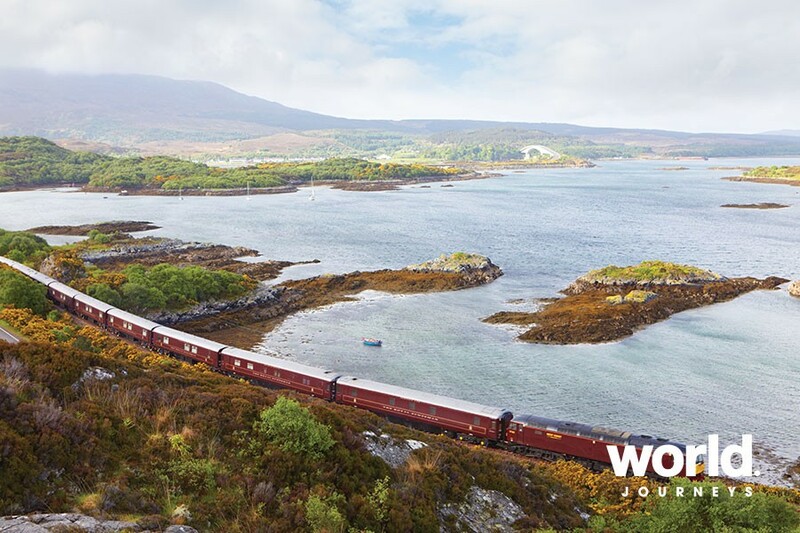 A journey on Belmond Royal Scotsman takes you straight to the heart of the Highlands, through landscapes of towering, pine-clad mountains reflected in mirror-still lochs. Just 40 guests travel through Scotland's finest countryside in private cabins, with an open-deck observation carriage behind. Life on board this luxury train is relaxed and indulgent, with gastronomic dining and the convivial atmosphere of celebrating with friends. After dinner, over a wee dram, a local clansman recounts tales that bring Scottish history alive. Along the way, guests disembark to meet local personalities, talk to experts on subjects from salmon fishing to whisky and take part in fun activities - truly a Scottish rail vacation par excellence. Belmond Royal Scotsman also features a brand new spa carriage - the Bamford Haybarn Spa is the first spa carriage to feature aboard Belmond's portfolio of luxury trains and features bespoke Bamford treatments for passengers travelling on overnight rail journeys throughout Scotland and Great Britain. Individually crafted wellbeing treatments are devoted to connecting the mind, body and soul with the natural world. The Bamford Bespoke Facial is a 55-minute ritual that aims to restore, rejuvenate and repair the skin. The treatment is finished with a deep tissue back massage focusing on Shiatsu pressure points with hot stones to release tension and promote deep relaxation. Other treatments on offer include the Bamford De-Stress Massage, Deep Tissue Massage, as well as manicures and pedicures using eco- natural Kure Bazaar nail polishes. 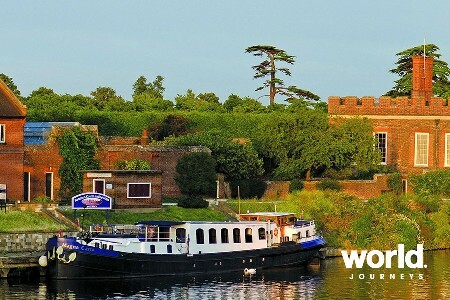 Ask us about a 'Whisky Tour', 'Heritage, Homes & Gardens', 'Grand Tour of Great Britain' and 'Majestic England' tours. We love that solo travellers can book a single cabin with no single supplement! Ask us about other itineraries from 2 to 8 nights. Day 1: Edinburgh > Keith Belmond Royal Scotsman departs Edinburgh Waverley Station in the early afternoon and travels north, crossing the Firth of Forth by means of the magnificent Forth Railway Bridge. This is one of the oldest cantilever bridges to be built, designed by Benjamin Baker in the late 1880s and considered one of the greatest achievements of the Victorian Age. Enjoy afternoon tea as you journey through the former Kingdom of Fife. The train follows the east coast, passing through Arbroath, Montrose and Aberdeen before arriving in the market town of Keith. An informal dinner is served on board, after which you are invited to the Observation Car to enjoy entertainment with a Scottish flavour. Day 2: Keith > Kyle of Lochalsh Departing Keith this morning, the train travels west along the Moray Firth towards Inverness, capital of the Highlands. Lunch is served on the way to Kyle of Lochalsh, on what is arguably the most scenic route in Britain. 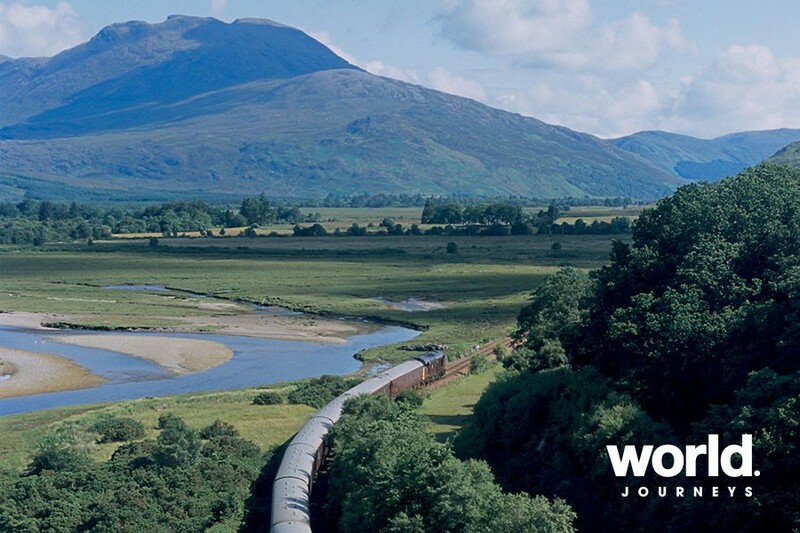 The line passes Loch Luichart and the Torridon Mountains, which geologists believe were formed before any life began. The train travels onwards through the small village of Achnasheen, before commencing the climb to the breathtaking Luib Summit and Achnashellach Forest. Descending to Strathcarron, it then follows the edge of beautiful Loch Carron through Attadale, Stromeferry and Duncraig. Arriving at the picturesque fishing village of Plockton, you alight to take a boat trip to see the colony of wild seals and enjoy magnificent views across the bay to the Applecross Mountains. There is also a woodland walk to be discovered and time afterwards to enjoy a traditional Highland welcome and a dram or two in the seafront Plockton Hotel. 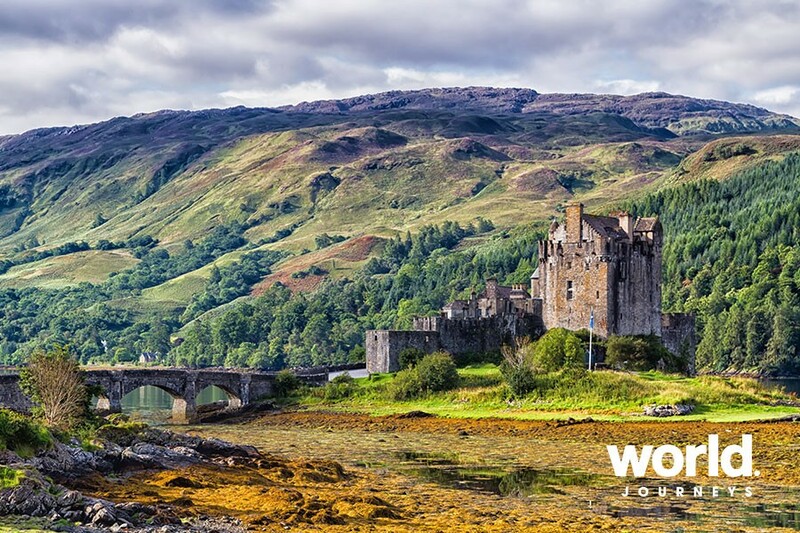 Alternatively, you can opt to visit one of Scotland's most iconic sights: Eilean Donan Castle, which perches on an island at the meeting point of three great sea lochs. A medieval stronghold of the clans Mackenzie and Macrae, the castle was largely destroyed in the 1719 Jacobite uprising and lay in ruins for two centuries. Lieutenant Colonel John Macrae-Gilstrap then bought the island and restored the castle to its former glory, also building a footbridge to provide access to the mainland. Since re-opening in 1932 it has become one of the most photographed monuments in Scotland and a visit provides a fascinating journey through the area's history. Return to the train in Kyle of Lochalsh, gateway to the mystical Isle of Skye, for overnight stabling. Dinner this evening is formal, and is followed by coffee and liqueurs in the Observation Car. Day 3: Kyle of Lochalsh > Boat of Garten Breakfast is served as the train leaves Kyle and retraces part of yesterday's route as far as Dingwall. 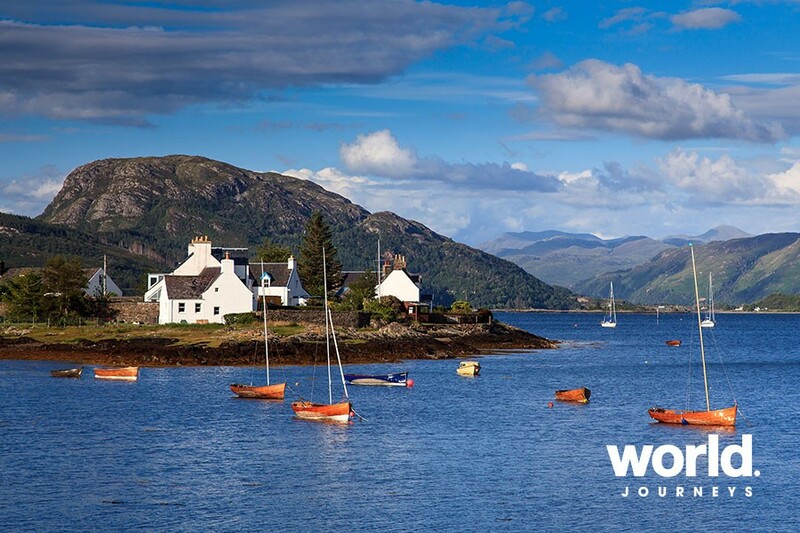 Have your cameras ready for the enchanting views of Plockton. Across the bay to the left you will glimpse whitewashed cottages with fishing boats and yachts riding at anchor. Disembark in Garve to visit Glen Ord Distillery, which is one of the oldest distilleries in Scotland, founded in 1838. Situated on the edge of the Black Isle, west of Inverness, Glen Ord continues to malt its own barley and practice centuries-old long fermentation and slow distillation methods. Enjoy a tour of the distillery and a private tasting and nosing session. Rejoin the train in Inverness in time for lunch. 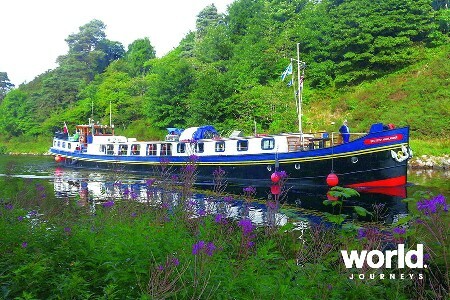 You then disembark in Carrbridge for an afternoon visit to Ballindalloch Castle. Located in the heart of the Speyside whisky region, Ballindalloch enjoys a majestic setting, surrounded by hills with the Spey and Avon rivers running through the grounds. The romantic baronial castle, known as the 'Pearl of the North', is the much-loved family home of the Macpherson-Grants, with treasures including a fine collection of 17th-century Spanish paintings, a sumptuous dining room, splendid vaulted hallway and impressive library. As an alternative to the castle tour, you can choose to play a round of golf on Ballindalloch's own challenging 9-hole golf course. Return to the train at Boat of Garten on the private Strathspey Railway. After an informal dinner, make your way to the Observation Car, where our entertaining Highlander paints a colourful picture of Scottish heroes and gives a dramatic insight into Highland life through the centuries. 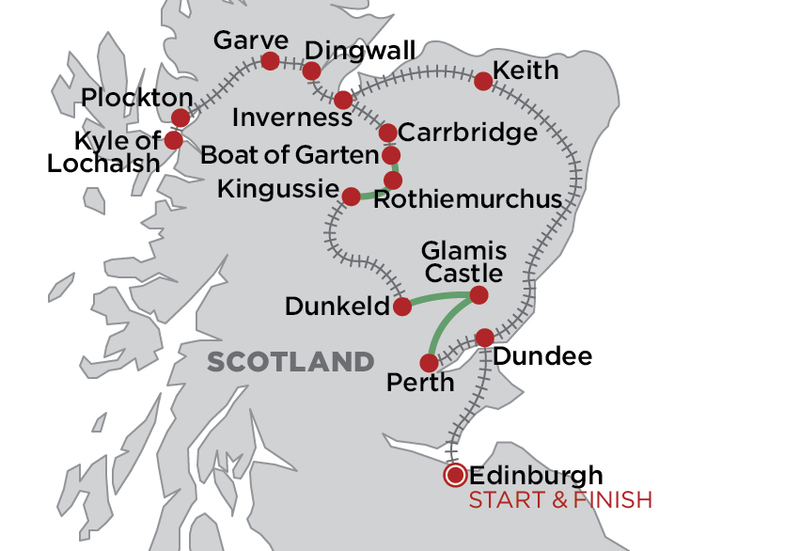 Day 4: Boat of Garten > Dundee After breakfast, travel the short distance by coach to Rothiemurchus Estate in the heart of the Cairngorms National Park. Rothiemurchus Forest is one of the largest and most important remnants of the native Caledonian pine forest, which used to cover most of Scotland. 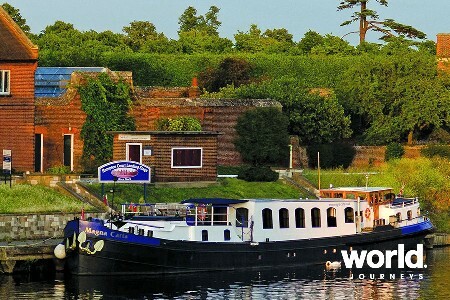 Choose from a number of activities including fishing, clay pigeon shooting and an estate tour. Afterwards you are warmly welcomed by your hosts in the hunting lodge, where, over refreshments, you can learn about the fascinating history of the estate that has been in the same family for over 400 years. 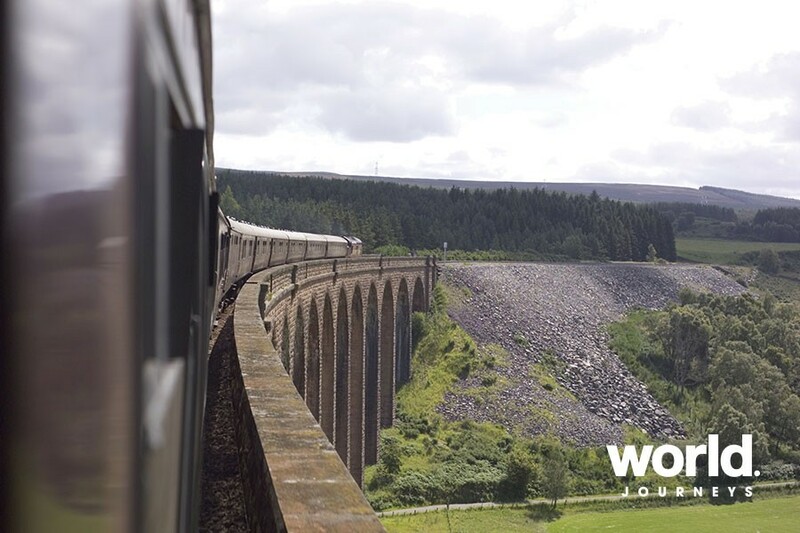 Return to the train in Kingussie and relax over a leisurely lunch on the journey south through Blair Atholl and Pitlochry to Dunkeld. Here you disembark for a private tour of Glamis Castle and its beautiful gardens. Seat of the Earl of Strathmore and Kinghorne, Glamis was the childhood home of the late HM Queen Elizabeth, The Queen Mother. The multi-turreted, fairytale castle houses many treasures, including rich tapestries, furniture and priceless works of art. Steeped in legend and myth, its dramatic history embraces alleged murderers, monsters and gamblers, stories of whom may be revealed during an illuminating tour. Outside, stunning parkland beckons, including an Italian Garden, nature trail, pinetum and four-acre walled garden. Rejoin the train in Perth and, as it makes its way to Dundee, prepare for a final formal dinner to mark your last night on board. 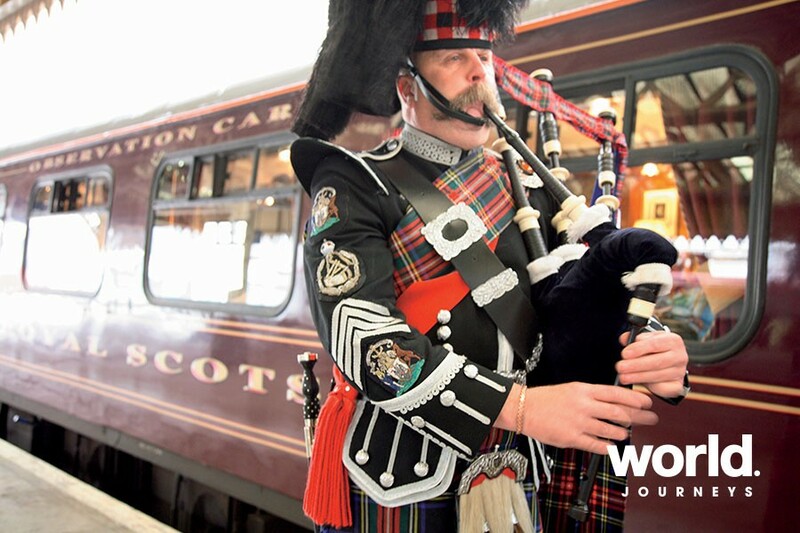 After your celebratory feast, you may feel inspired by our musicians to partake of some lively Scottish country dancing on the station platform, a fitting finale to your Classic tour. Day 5: Dundee > Edinburgh Breakfast is served as the train leaves Dundee and crosses the Tay Bridge into the former Kingdom of Fife and on to Edinburgh, where your journey ends. 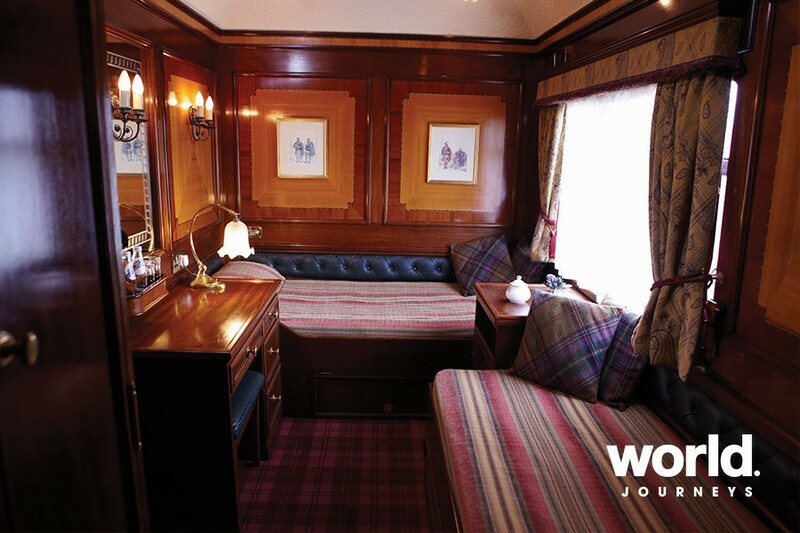 Please note: Belmond Royal Scotsman operates within the constraints of the railway network. As such timings, routes and associated itineraries are subject to change. Belmond Royal Scotsman departs Edinburgh at 1.43 pm on day one and arrives back in Edinburgh at 9.50 am on day five. Please note: Itineraries are subject to change and all timings shown are for your guidance only. Confirmed itineraries and timings will be supplied with your travel documents. Single price is for sole occupancy of a single cabin. For single occupancy of a twin cabin a 60% supplement applies. 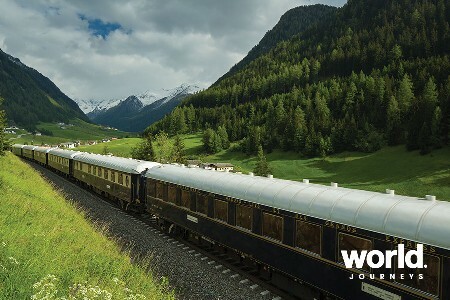 Book to travel on Belmond Royal Soctsman in May and June 2019 and save 25% on a companion fare. Offer applies to new bookings deposited by 30 April 2019, and is subject to availability. Further T&Cs apply.